Fist City, Hawaii. To the locals, you already know why our city has been christened with such a haughty nickname. To the outsiders, to put it straight forward, Hawaiians get busy. We’re mindful, peaceful people for the most part as long as you don’t come at us with the screwface. In a cultural text, this was (and can still be) referred to as Ku’i A Lua or “The Art Of Lua Fighting.” Lua meaning “a type of hand-to-hand fighting in which the fighters broke bones.” Weapons were scarcely used in this type of warfare, just straight up 1-on-1 scrapping with a more ferocious fringe, although a much more conventional variety of combat. Ku’i A Lua was also the divine deity (God) who versified, educated and trained the select few who practiced this style of fighting; so you see, this ‘gift of jab’ has been passed down by the Gods. This Saturday, we are proud to reveal this special project we’ve been working on a for a minute, and we’ve sort of stepped foot into unchartered territories. Basically we’re taking things a step further, and went ahead and produced our first ever Fitted backpack. It’s official. 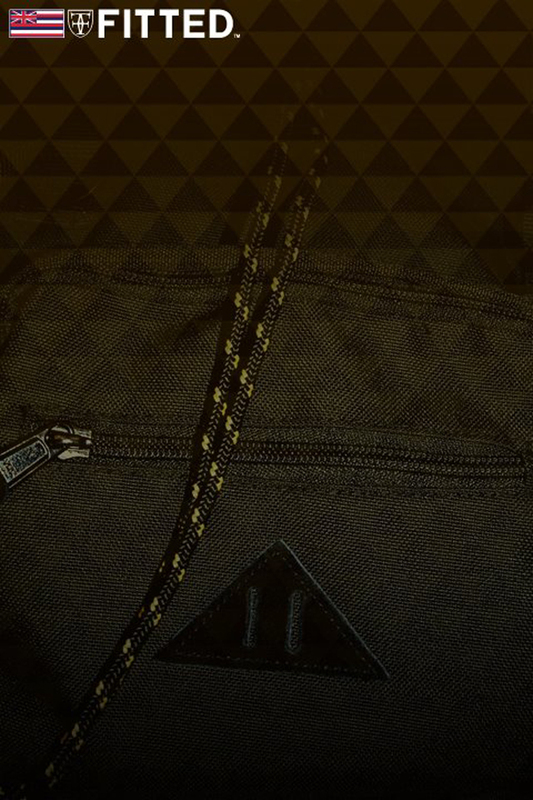 Here are the details breakdown: We’ve given it a fitting name, ‘Kama Hele’ which, roughly translated means ‘traveler’ and is 100% military grade – which means 100% durability, rugged, but still with that Fitted freshness you’ve grown accustomed to. 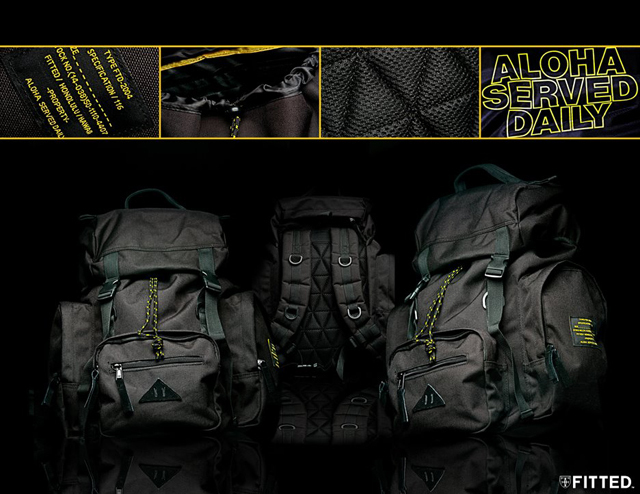 Also featuring 1000 denier Cordura (that good stuff), with 7 compartments (1 hidden compartment), heavy duty all black zippers and pull strings, black suede on the bottom of the backpack, as well as on the zipper pulls. The inside bottom of the bag features “Aloha Served Daily” in all yellow. The backside padding utilizes the triangle-tribal pattern (TRI-LOCKS) – it may sort of come off as a simple bag, which it is – but there are Countless, subtle details that you’ll definitely notice that gives it a whole different appeal that you will love. We hope that you will enjoy this piece of product as much as we loved building it. Please feel free to send us random photo’s of your travels! 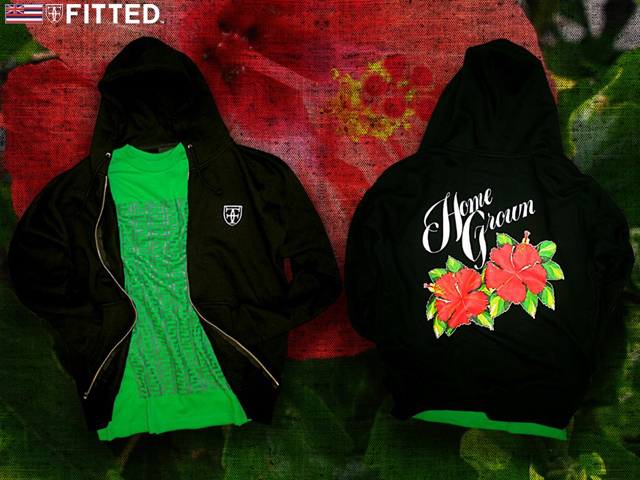 Aloha & Mahalo for your continued support! 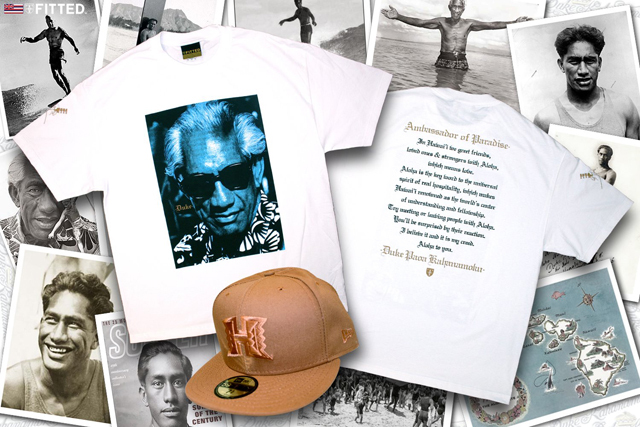 Continuing on with the legacy of Duke Kahanamoku, we’ve yet one more tee to celebrate the life of the legendary man. 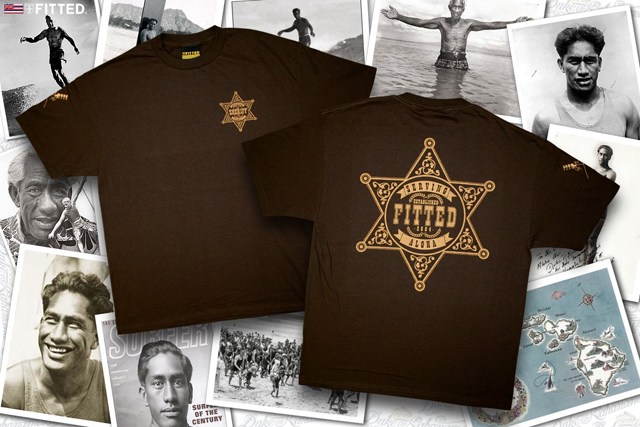 This specific tee, which we gave the name “Ho’okoa” (which means “brave”), is in admiration of Duke’s bravery. Kahanamoku rescued eight personnel from a capsizing fishing vessel off the coast of Newport Beach. During the extremity of this situation, 29 fishermen from the vessel fell into the heavy seas and out of those 29, 17 perished. Duke used just his surfboard in order to retrieve as many fishermen as he could rescue. From this, the “tradition of lifeguards having rescue surfboards at the ready.” Courageous valor at it’s finest. Ever since President-elect Barack Obama disclosed to the public and the Nation that he would be running for President nearly 2 years ago at the exact location where Abraham Lincoln gave his epoch-making “House Divided” speech, many Americans, young and old – have been holding high expectations for hope for a better tomorrow and a more patriotic America. 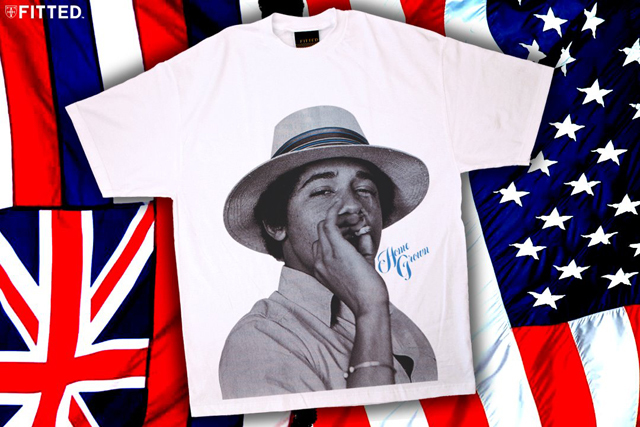 Over the course of his one year campaign, the Hawaii born & raised Obama has emphasized his top three priorities; should he ever take the seat that the incompetent George W. Bush currently holds as Commander In Chief – those priorities being to provide universal health care, ending the illegal Iraqi War and steadily increasing energy independence. 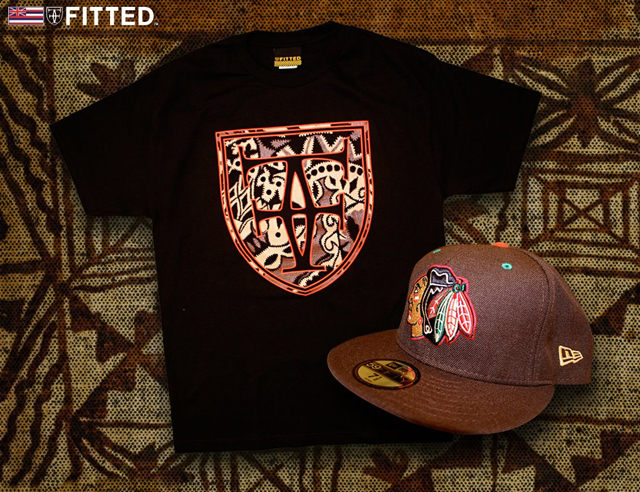 The above “fictional story” leads us to our newest release which will feature 2 new shirts along with a custom New Era snapback dubbed “Pantanama.” The hat sees heavy inspiration from the tropical rain forests one might see in South America (Brazil, Colombia, Chile, Peru, etc.). Each hat is unique, in that the fabric cut used differentiates, so no hat is alike. Rich with greens, red, blue and yellow the cap sees parrots, green shrubbery and tropical leaves & plants. The inside features a satin lining of blue & white tri-lock patterns. The left side has a white crown hit, right side with a white New Era hit and the back sees a white crest hit. 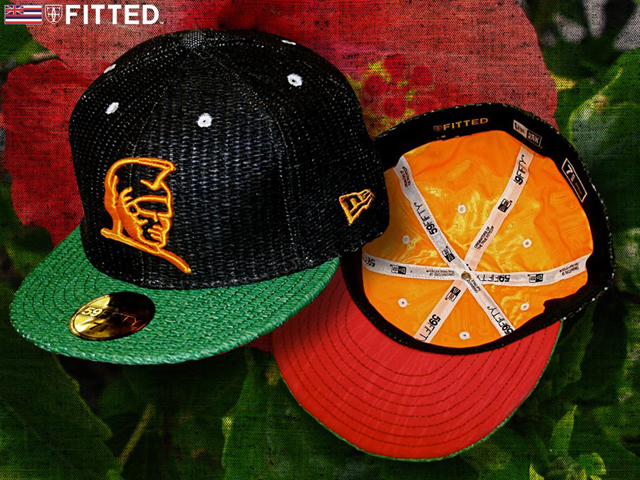 These are snapbacks, so one size should fit all. 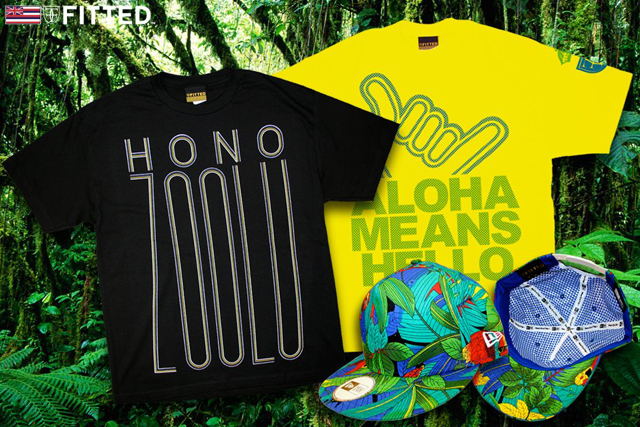 There’s a new “Aloha Means Hello” tee printed on yellow with a blue shaka on the front & back, green lettering (Aloha Means Hello & Goodbye) with a blue crest & green crown on the left sleeve. Sets off the above hat superbly. 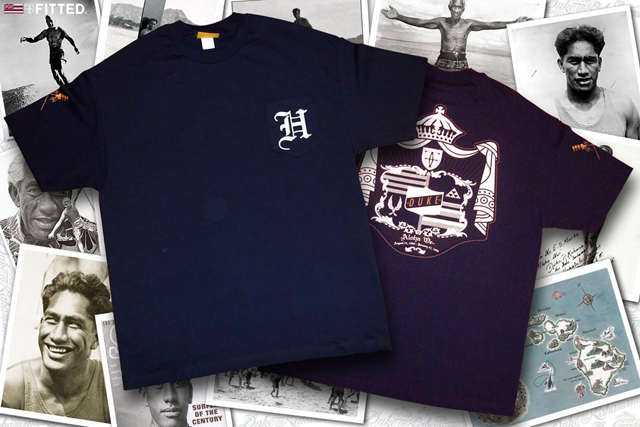 The other shirt is run on all black and features “HONOZOOLU” in blue & reflective white with the crown hit on the back. Everything is limited in numbers so please stick & move when it comes to release day to make sure you get yours! Just a heads up, we have a brand new t-shirt and custom MLB pack. 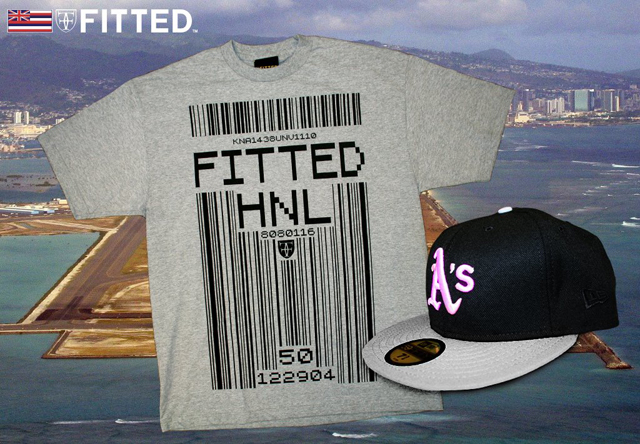 The t-shirt dubbed “Raising The Bar” which features a UPC (Universal Product Code) barcode printed in black on the front with Fitted HNL in black lettering. Barcodes play an integral role in all retail businesses which makes it easier to track inventory coming in as well as going out. They’re such a common thing to see on almost everything one purchases, from groceries to clothing, music, DVDs, electronics, etc. There’s also a custom Oakland A’s hat we’re releasing with the shirt seeing all black on all top paneling, a gray wool brim, tonal eyelets and a pink A’s logo. We’re back to our normal Saturday releases tomorrow. Brand new t-shirt plus custom UH black tonal hat. 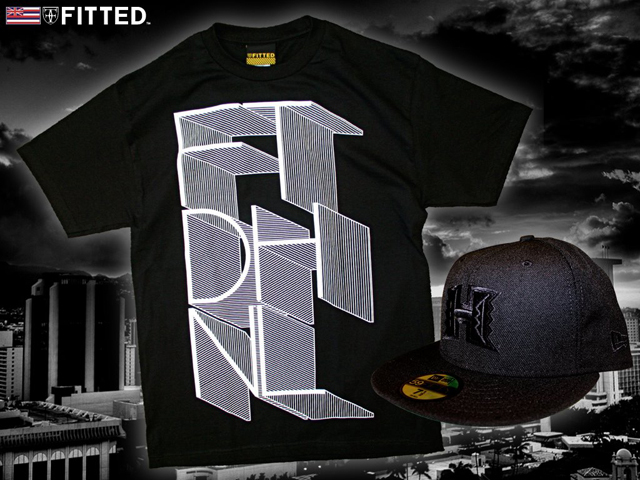 The shirt, titled “Motivation” is printed on all black and features the letters “FTD” (Fitted) & “HNL” (Honolulu) in 3-D block lettering with using white. Motivation should be in everyone’s vocabulary these days, for without motivation, there’s no desire to reach one’s goals. Motivate and execute, never procrastinate. To go along with the tee is an all black tonal UH New Era; everything is blacked out with the exception of the underbill which is green. The hats & tees, as always, are limited in numbers so please head down to make sure you all get yours. Just a heads up, another new tee named “Niho Niho” which is printed on all black and features the crest on the front with an orange outlining and a really dope ancient Hawaiian fill on the inside. The back features the crown, also in orange. To coincide with the shirt is a custom NHL Chicago Blackhawks in all brown with an orange underbill, green eyelets, orange button and an array of colors in the Blackhawks logo. Come through & swoop the whole pack up.